In March this year, a protest was held outside a Georgian government office by a supporter of an inmate whom he believed to have been unjustly charged and incarcerated. The inmate in question is former Prisons Minister Bacho Akhalaia, from Georgia’s western Samegrelo region. The protester smeared his body with honey and announced his willingness to exchange places with the inmate. The footage of this spectacle can be seen here. This spectacle was perplexing for the foreign media covering the incident for whom the reference to honey had no meaning. 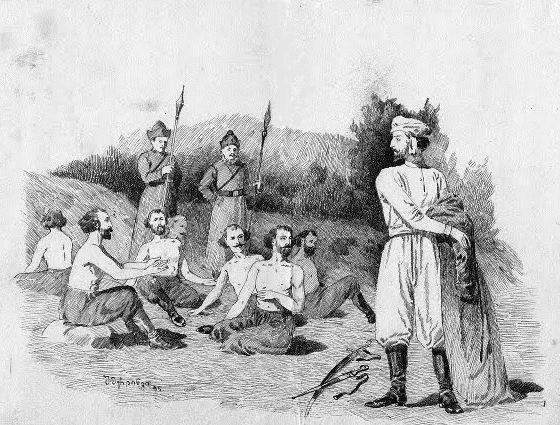 For Georgians, particularly those from Samegrelo, it is a well known image of self-sacrifice and faith in the incarcerated, first practiced by Prince Tsotne Dadiani of Samegrelo. His life is commemorated by the Georgian Church today. The Dadiani family are believed to have moved from the mountainous Svaneti region in western Georgia to the subtropical Black Sea region of Samegrelo in antiquity. They were rulers of the Samegrelo region for from the 12th-19th centuries, as dukes, archdukes and principals. A scholarly source of information on this family is the Smithsonian Institute in the USA; a useful concise history of the region can be found here and the Dadiani family history can be found here. Tsotne was the son of Shergil, the pre-eminent noble of western Georgia and the Eristavi (duke) of Samegrelo. During the Mongol occupation of Georgia in the 13 century, he was regent for the western half of the Kingdom of Georgia, a position he shared with the Duke of Racha, a mountainous region in Georgia’s northwest. He was also a Lord High Steward (Mandaturt-Ukhutsesi) of Georgia, and upon the death of his brother Vardan III, the Eristavi of Samegrelo (or Odishi as it was known at the time). “Saint Tsotne Dadiani, a virtuous military leader and the prince of Egrisi, lived in the middle of the 13th century. During that time Georgia languished under the yoke of Mongol oppression. Having assembled at the peak of Mount Kokhta (in the Meshkheti region of southern Georgia), rulers from all over Georgia agreed to assemble the troops in Kartli and attack on a single front. Tsotne Dadiani and the ruler of Racha were the first to muster their armies. But there were traitors among them, and the Mongols learned of the conspiracy. They surrounded Mount Kokhta, arrested the rebels—save for Tsotne Dadiani and the ruler of Racha—and led them away to the Mongol ruler at Anis-Shirakavan. The prisoners denied every accusation and asserted that the purpose of the gathering on Mount Kokhta was to collect the tribute that the Mongol authorities had demanded. Infuriated at their insurgency, the Mongols stripped them bare, bound their hands and feet, smeared them with honey, threw them under the scorching sun, and interrogated them daily about the gathering on Mount Kokhta. The ruler summoned him and demanded an explanation. “We gathered with a single goal—to collect the tribute and fulfill your command. If it was for this that my countrymen were punished, I also desire to share in their lot!” answered the courageous prince. Tsotne’s chivalrous deed made a dramatic impression on the Mongols, and every one of the prisoners was set free. Tsotne Dadiani is not mentioned in accounts of the next conspiracy against the Mongols, in the year 1259. Historians believe that he had already reposed by that time. The virtues of Saint Tsotne Dadiani are known to all throughout Georgia. His heroism and integrity are an example of faith, love and devotion to every generation, and the faithful of every era have honored his holy name.